Mrs. Tiger Woods. Hmmm, does she go by Elin Nordegren, Elin Woods, or Elin Nordegren-Woods? Anyone know? I'm not sure. But I am sure that it's nice to ring in the new year with her. 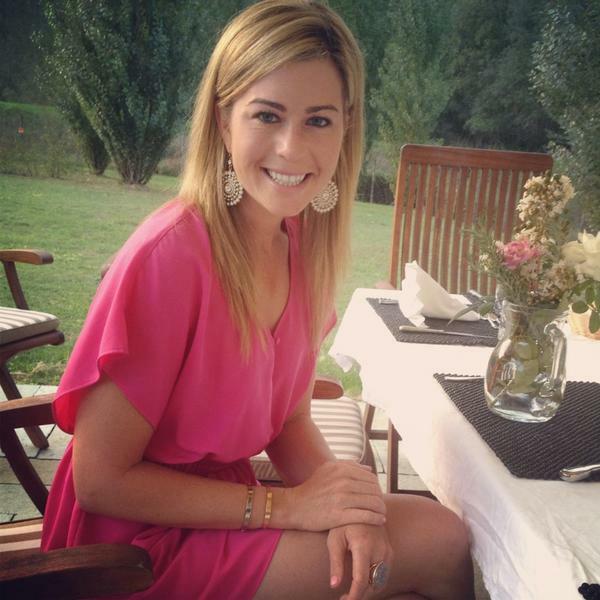 Elin should be close to delivering the Woods' second child, guaranteeing golf's first couple a happy new year. And we wish all of you the happiest of times in 2009. Jayvie Agojo is a senior on the Pepperdine University women's golf team. A native of the Philippines, Jayvie was three times named "Outstanding Women's Golfer of the Year" by the Philippines Sports Writers' Association, while still in high school. She won the Optimist International Junior Golf Championships in 2002 and 2003, was a member of the Philippines National Team, and was the No. 1-ranked junior golfer in her home country. After hitting Southern California, Jayvie earned All-West Coast Conference honors during a freshman season that culminated in her being named WCC Freshman of the Year. In her sophomore season, she posted five Top 10 finishes. In both her sophomore and junior years, she again earned all-conference honors. Her senior season is looking like more of the same. Jayvie helped lead Pepperdine to second-, tenth- and first-place finishes in the team's Winter season tournaments. Jayvie herself had a third-place and a sixth-place showing in those three events. Maria Verchenova is a pioneer in the world of Russian golf. Heck, five years ago there was no world of Russian golf! Now, Maria is the only Russian playing on the Ladies European Tour - or, for that matter, on any other non-feeder tour around the world (the Kostina sisters play on the Futures Tour). "My dad took me to the Czech Republic when I was 12 and we went for a coffee at a golf club," Verchenova said. "The next day we went back and I tried hitting a few balls with a local coach. He said I had a talent for the game and I should play. When I got back we went to Moscow City Golf Club and that's how I started. "I didn’t even know what golf was when I was young because my family was poor and everybody in Russia is focused on tennis. But thanks to my parents I was given a chance." After several strong showings in European national amateur championships, Maria earned her LET card and 2007 was her rookie season. She had one Top 10 finish that year, but had to return to Q-School to earn back her status for 2008. How's it going this year? Verchenova finished 11th at the DB Ladies Swiss Open and fifth - her best showing to date - at the Tenerife Ladies Open. She's had some ups and downs this season, but her LET card is secure and, as I write this, she is tied for third after two rounds of the Dubai Ladies Masters. As for what the future holds, Maria told me that she hopes to enter LPGA Q-School at the end of 2009, with LPGA membership in 2010 the goal. This photo of Anna Grzebien is another from her Wilhelmina 7 portfolio. The W7, you'll recall, is a group of seven LPGA players represented by the prestigious Wilhelmina Artist Management group. 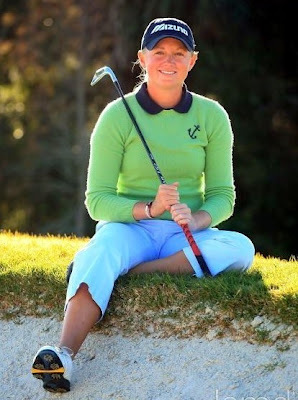 Anna's rookie season on the LPGA Tour in 2008 wasn't quite as good as she would have hoped for, partly because her non-exempt status allowed Anna to play in only 15 tournaments, and many weeks she wouldn't know until the last minute whether she was getting into the field. So she took care of that problem at Q-School last week. 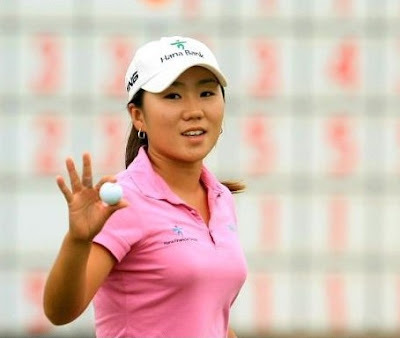 Grzebien finished third in the LPGA Final Qualifying Tournament, earning full playing privileges for 2009. Anna closed the pressure-packed event with a 65, easily the best round of the day. Look for the former Duke All-American to have a much higher profile on tour next season. Here's a golfer we'll be seeing a lot of in years to come. Stacy Lewis will be part of a stellar 2009 class of rookies on the LPGA Tour after winning the tour's Final Qualifying Tournament by three strokes. 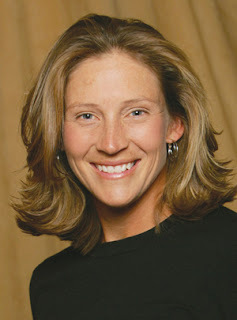 Stacy completed her collegiate career at the University of Arkansas earlier in 2008, a career capped off by her inclusion on the American Curtis Cup team. While at Arkansas, she won the 2007 NCAA Championship, posted double-digit wins in other tournaments, and was a multiple All-American selection. Pretty amazing considering that she suffered from scoliosis as a child and missed her freshman season recovering from spinal fusion surgery. Lewis turned pro in mid-2008, and several weeks later finished third at the U.S. Women's Open. It was her second Top 5 finish in a major; in 2007, still an amateur, she finished fifth at the Kraft Nabisco Championship. Jeanne Cho-Hunicke is probably best-known to date as one of the finalists on "Big Break V: Hawaii." But now you can call her a member of the LPGA Tour. 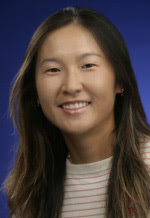 Cho-Hunicke earned priority status by finishing 15th at the LPGA's 2008 Final Qualifying Tournament. Jeanne carded rounds of 71, 71, 69, 68 and 74, finishing 7-under par. The LPGA Final Qualifying Tournament begins on Dec. 3, with 140 golfers trying to earn 2009 tour cards. And Beatriz Recari is among those 140 in the field. Bea, from Spain, has played the Ladies European Tour the past couple seasons. The image above is from the 2009 World Ladies Golf Calendar published by Golf Digest Japan. Bea is one of four golfers featured in the calendar. Elena Kurokawa is a native of Tokyo now living in California. She played college golf for UNLV, where she had 12 Top 10 finishes, was named to the all-conference team twice (2005-06) and was the Mountain West Player of the Year in 2005. And where she also majored in psychology, something that should come in handy for any golfer. Elena turned pro in 2006 and played the Futures Tour in 2007 and 2008. She's also part of the Play Golf Designs team that we write about from time to time here at Golf Babes. Check 'em out, you might even be able to schedule a match with Elena! Oh, and an inside source tells me that she's koo-koo for Camilo. 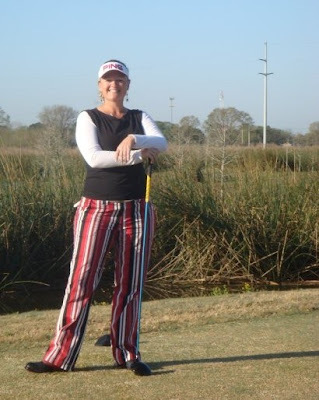 I know nothing about fashion - golf or otherwise - but I know great golf pants when I see 'em. And those are great golf pants. Janell Howland was wearing them in Lafayette earlier this year, where she was defending champion in the Futures Tour tournament played there. Janell is heading to California next week to play in the LPGA Q-School sectional qualifier at Mission Hills Country Club (Dinah Shore Course) in Rancho Mirage. She'll be trying to get back to the LPGA Tour, of which she was a member in 2005. She also just launched her Web site. Check it out at janellhowland.com.